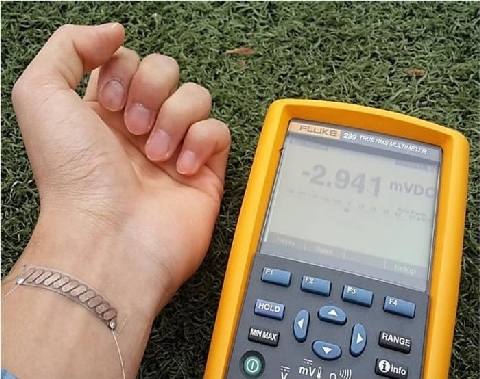 A team of domestic researchers developed a thermo-element that produces electricity when worn on human body using the body temperature. This technology, which can solve the problems associated with wearable device batteries, is expected of commercialization within the next two ? three years. The Ministry of Science, ICT and Future Planning announced on the 7th that a team led by Professor Jo Byeong-jin of Korea Advanced Institute of Science and Technology (KAIST) had developed a ‘wearable thermo-element` that can be used as a power supply source for wearable devices. Thermo-elements convert thermal energy to electric energy. The existing commercial level thermo-elements made with ceramic substrates are hard, unbendable, heavy and low in energy efficiency, and thus are difficult to be applied to wearable electronic devices. The new thermo-element is made with glass fiber, and thus can be processed in the form of clothing. It is also lightweight and high in electric power production efficiency. Compared to ceramic substrate elements of the same weight, electric power production capacity of the new thermo-element is higher by as many as 14 times. Made in the shape of a band measuring 10cm in length and width that can be worn around the arm, this thermo-element can produce electricity of approx. 40mW when outside temperature is 20?C (approx. 17?C lower than body temperature). This is enough to start a semiconductor chip. When made in the size equivalent to a jacket (50cm ? 100cm), it produces approx. 2W, which is enough for using a mobile phone. When commercialized, the thermo-element will mark a groundbreaking turning point in power supply to wearable devices. Wearable device batteries available at the moment have a short lifespan, and thus need to be changed frequently. In addition, users found it inconvenient to carry around the heavy and large batteries. In particular, unlike the existing elements, the new thermo-element can be manufactured with a large area, which facilitates mass-production. Therefore, it is highly likely to be used as a key power supply source for wearable devices. It also shows possibility to solve energy issues occurring in various areas where waste heat is generated, such as automobiles, plants, aircrafts, and ships. This study was conducted as part of a base type convergence study project supported by the Ministry of Science, ICT and Future Planning since 2010 and the results were published in the breaking news section of the March 14 online edition of ‘Energy & Environmental Science,’ the most prestigious journal in energy and environment fields. 국내 연구진이 입고 있으면 체열을 활용해 전기를 생산하는 열전소자를 개발했다. 웨어러블기기의 배터리 문제를 획기적으로 개선할 수 있는 기술로, 2~3년 내 상용화될 것으로 기대된다. 미래창조과학부는 조병진 한국과학기술원(KAIST) 교수팀이 웨어러블기기 전력 공급원으로 사용할 수 있는 ‘입을 수 있는 열전소자’를 개발했다고 7일 밝혔다. 열전소자는 열에너지를 전기에너지로 전환해주는 소자다. 기존 상용 열전소자는 세라믹 기판을 이용해 단단하고 휘어지지 않으며, 무게가 무겁고 낮은 에너지 효율로 인해 웨어러블 전자기기에 활용하기가 어려웠다. 이번에 개발한 열전소자는 유리섬유를 이용해 의류 형태로 가공할 수 있고, 무게가 가볍고 전력생산 효율도 높다. 같은 무게의 기존 세라믹 기판 소자에 비해 전력생산 능력이 약 14배나 된다. 이 열전소자를 팔에 두를 수 있는 가로 세로 각 10㎝인 밴드로 제작하면 외부 기온이 영상 20도일 때(체온과 약 17도 차이가 나는 경우) 약 40㎽의 전력을 생산한다. 웬만한 반도체 칩을 구동할 수 있는 수준이다. 상의 전체에 해당하는 면적(50㎝×100㎝)으로 제작해 입으면 약 2W의 전력을 생산해 휴대폰 사용도 가능하다. 연구팀이 개발한 열전소자가 상용화되면 웨어러블기기 전력공급에 획기적인 전환점이 될 것으로 기대된다. 현재는 웨어러블기기용 배터리 수명이 짧아 배터리를 자주 교체하거나 크고 무거운 배터리를 가지고 다녀야하는 단점이 있다. 특히 기존 상용소자와 달리 대면적 소자 제작이 쉬워 대량 생산에도 유리해 웨어러블기기 핵심 전력공급원으로 사용될 가능성이 매우 높다. 웨어러블기기 뿐만 아니라 자동차, 공장, 항공기, 선박 등 폐열이 발생하는 다양한 곳에 적용할 수 있어 에너지 문제를 해결하는 수단으로 가능성도 있다. 조병진 교수는 “소자의 집적공정 최적화와 대량생산만 해결하면 2~3년 내 상용화가 가능할 것”이라며 “쉽게 대량생산할 수 있어 생산단가도 현재 배터리보다 낮은 수준이 될 것”이라고 말했다. 조 교수는 “이 소자를 상용화해 옷처럼 입고 다니면 전기가 생산돼 배터리가 필요 없는 휴대형 기기 시대를 열고 싶다”고 밝혔다. 이번 연구는 지난 2010년부터 미래부가 지원한 기반형융합연구사업 일환으로, 연구결과는 에너지?환경 분야 최고 권위지 ‘에너지&인바이런먼틀 사이언스(Energy&Environmental Science)’ 3월 14일자 온라인 속보로 게재됐다.